다중 네트워크 상호연동에서의 홈 에이전트에 의한 동적 홈 어드레스 할당 방법 및 장치가 제공된다. The dynamic home address allocation method and apparatus according to the home agent in a multi-network interworking is provided. 본 발명은, 이동국으로부터 네트워크 장치로 키 인가 요구를 송신하는 방법 및 장치를 제공하는데, 이 요구는, 데이터를 수신하는 것을 계속하기 위해서 이동국이 외부 에이전트 CoA 를 이용하길 원한다는 것을 나타낸다. The present invention is to provide a method and apparatus for transmitting a key request to the network device is from a mobile station, the request indicates that the mobile station wants want to use a foreign agent CoA, in order to continue to receive data. 네트워크 장치는 임시 어드레스를 이동국에 할당하고, 이동국에 대한 보안 정책 데이터베이스를 생성한다. The network device assigns a temporary address to a mobile station, and generates a security policy database for the mobile station. 이동국은 서비스를 제공가능할 수도 있는 외부 에이전트로부터 에이전트 광고를 수신한다. The mobile station receives an agent advertisement from a foreign agent, which may be providing services. 이동국은 외부 에이전트에 등록한다. The mobile station registers with the foreign agent. 그런 다음, 네트워크 장치는 외부 에이전트의 정보를 반영하기 위해서 보안 정책 데이터베이스를 변경한다. Then, the network device to change the security policy database to reflect the information of the external agent. 그런 다음, 홈 에이전트는 홈 어드레스를 이동국에 할당하고, 네트워크 장치는 선택자로서 모바일 장치의 홈 어드레스만을 포함하도록 보안 정책 데이터베이스를 업데이트한다. Then, the home agent assigns the home address to the mobile station and the network device to update the security policy database to include only the home address of the mobile device as a selector. 이 특허 출원은, 2005 년 6 월 14 일자로 출원되고 그 양수인에게 양도되며 본 명세서에 참조로서 명백히 포함되어 있는, 발명의 명칭이 "3G-WLAN 상호연동에서의 홈 에이전트에 의한 동적 홈 어드레스 할당 (DYNAMIC HOME ADDRESS ASSIGNMENT BY HOME AGENT IN 3G-WLAN INTERWORKING)" 인 미국 가출원 제 60/690,621 호에 대해 우선권을 주장한다. This patent application, June 2005 and filed on 14, dynamic home address assignment by the assignee, and assigned to the home agent in the present specification clearly is, the title of the invention "3G-WLAN inter-working, which incorporated by reference ( DYNAMIC HOME ADDRESS ASSIGNMENT bY HOME AGENT iN 3G-WLAN INTERWORKING) claims priority to "US Provisional Application No. 60 / 690,621 calls. 본 발명은 통신 시스템에 관한 것으로, 보다 상세하게는 다중 네트워크 상호연동에서의 홈 에이전트에 의한 동적 홈 어드레스 할당 방법 및 장치에 관한 것이다. The present invention relates to a communication system, and more particularly to a dynamic home address allocation method and apparatus according to the home agent in a multi-network interworking. 또한, 본 발명은 다중 네트워크 상호연동을 위한 아키텍처를 제공한다. In addition, the present invention provides an architecture for a multi-network interworking. 무선 통신 기술은 최근 수년간 거대한 성장을 보였다. Wireless communication technology showed huge growth in recent years. 이 성장은 무선 매체를 통한 음성 및 데이터 통신의 크게 개선된 품질 및 무선 기술에 의해 제공되는 이동의 자유에 의해 부분적으로 야기되었다. This growth has been caused in part by the freedom of movement offered by wireless technologies and the greatly improved quality of voice and data communications over the wireless medium. 데이터 서비스의 부가와 함께 음성 서비스의 품질이 개선되었고, 계속해서 통신 대중에 대해 현저한 영향을 미칠 것이다. Has improved the quality of voice services with the addition of data services will continue to have a significant impact on public communications. 부가적인 서비스는 로밍하면서 모바일 장치를 이용하여 인터넷에 액세스하는 것을 포함한다. Additional services while roaming involves accessing the Internet using a mobile device. 이동하면서 데이터 세션을 유지하는 능력은 이용자 및 시스템 운영자 모두에 대해 중요하다. The ability to maintain a data session while moving is important to both users and system operators. 이용자가 이동함에 따라, 이용자는, 예를 들어 WLAN (Wireless Local Area Network) 으로부터 제 3 세대 (3G) 네트워크로의 이동과 같이, 하나의 네트워크 타입으로부터 또 다른 네트워크 타입으로 변경될 수도 있다. , The user may, for example, as to the third-generation mobile (3G) networks from the WLAN (Wireless Local Area Network), may be changed to another type of network from one network type as the user moves. 모바일 인터넷 프로토콜 버전 4 (Mobile Internet Protocol Version 4: MIPv4) 와 같은 각종 프로토콜은, WLAN 시스템과 3G 시스템 사이에서 이동국 (MS) 이 이동함에 따라 데이터 세션 연속성을 제공하는데 이용될 수도 있다. Mobile Internet Protocol version 4: Various protocols, such as (Mobile Internet Protocol Version 4, MIPv4) is, may be used to provide a data session continuity, as the mobile station (MS) is moved between the WLAN system and the 3G system. 도 1 은 WLAN 시스템과 3G 시스템 사이에 데이터 세션 연속성을 지원하기 위한 상호연동 아키텍처를 도시한 도면이다. 1 is a diagram showing an interworking architecture for supporting a data session continuity between WLAN system and the 3G system. 아키텍처 (100) 는, 3G 홈 액세스 네트워크 (104) 또는 WLAN 시스템 (110) 에 접속된 다수의 MS (102) 를 포함한다. The architecture 100 may include a number of the MS (102) connected to the 3G home access network 104 or WLAN system 110. 3G 홈 액세스 네트워크는, 이 도면에는 단 1 개의 BTS (Base Transceiver Station) 만이 도시되어 있지만, 다수의 BTS, 및 역시 단 1 개만 도시되어 있는 다수의 기지국 컨트롤러/패킷 제어 기능부 장치 (BSC/PCF ; 108) 를 포함한다. 3G home access network, the drawings are shown're just one BTS (Base Transceiver Station), a plurality of BTS, and also end with only one number of a base station controller / packet control, illustrated functional section unit (BSC / PCF; 108) a. BTS 는 3G 홈 액세스 네트워크 (104) 에서 BSC/PCF 에 접속된다. BTS is connected to the BSC / PCF in the 3G home access network 104. WLAN 시스템 (110) 은 액세스 포인트 (AP ; 112) 및 액세스 라우터 (AR ; 114) 를 포함한다. Includes; (114 AR); WLAN system 110 includes an access point (AP 112) and the access router. 또한, WLAN 시스템은 3G 홈 코어 네트워크 (116) 에 접속된다. In addition, WLAN system is connected to the 3G home core network 116. 3G 홈 액세스 네트워크 (104) 는 패킷 데이터 서비스 노드 (PDSN ; 118) 를 통해 3G 홈 코어 네트워크 (116) 에 접속한다. 3G home access network 104 is a packet data service node (PDSN; 118) is connected to the home 3G core network 116 via a. PDSN 은 홈 에이전트 (HA ; 124), 및 홈 인증, 인가 및 계정 (H-AAA) 장치 (120) 에 접속된다. The PDSN home agent; is connected to the (HA 124), and a home authentication, authorization, and accounting (H-AAA) device 120. 이에 반해, WLAN 시스템은 패킷 데이터 상호연동 기능부 (PDIF ; 122) 를 통해 3G 홈 코어 네트워크 (116) 에 접속한다. On the other hand, WLAN system, a packet data inter-working function unit (PDIF; 122) is connected to the home 3G core network 116 via a. 또한, PDIF (122) 는 HA (124) 및 H-AAA (120) 에 접속된다. Also, PDIF (122) is connected to the HA (124) and the H-AAA (120). 모바일 IPv4 는 시스템 간 이동을 위해 외부 에이전트 CoA (Foreign Agent Care of Address: FA CoA) 모드를 제공한다. Mobile IPv4 foreign agent is to move between systems CoA: provide (Foreign Agent Care of Address FA CoA) mode. 이 모드에 있어서, HA 는 이용자 데이터 트래픽에 대한 고정 포인트의 역할을 한다. In this mode, HA acts as a fixing point for the user data traffic. MS 가 WLAN 또는 3G 시스템으로 이동하는 경우, MS 는 HA 에 등록한다. If the MS moves to the WLAN or a 3G system, MS registers in the HA. HA 가 MS 로 향하는 데이터 패킷을 MS 가 등록된 WLAN 또는 3G 시스템으로 라우팅하기 이전에, 등록이 인증 및 인가된다. HA is a data packet destined for the MS before the MS is to route to the registered WLAN or a 3G system, is applied to the authentication and registration. HA 가 홈 3G 시스템의 자원이기 때문에, 이는 인가된 MS 만 시스템에 액세스하도록 한다. Since the HA is the home 3G system resources, which is applied only to the MS to access the system. 다음의 실시예가 설명하는 바와 같이 FA CoA 가 동작한다. The following embodiments of the FA CoA as described operates. 초기에, MS 는 WLAN 시스템 (110) 에서 패킷 데이터 세션을 시작한 다음, 3G 시스템 (104) 으로 이동한다. Initially, MS will start a packet data session from the WLAN system 110 to the next, 3G system 104. WLAN 시스템에 있는 동안, MS 는 PDIF 와 IPsec (Internet Protocol Security) 터널을 확립한다. While in the WLAN system, MS establishes a PDIF and IPsec (Internet Protocol Security) tunnel. 터널이 확립된 이후에, PDIF 는 그 CoA 를 MS 에 광고하기 위해서 FA 의 역할을 할 수도 있다. After the tunnel has been established, the PDIF may FA roles in order to advertise its CoA to the MS. MS 는 이 CoA 를 HA (124) 에 등록한다. MS registers the CoA in the HA (124). 이 등록은 HA 로 하여금 MS 로 향하는 패킷을 PDIF (122) 로 터널링하도록 하고, 다음에 PDIF 는 이 패킷을 MS 로 포워딩한다. This registration allows the HA and to tunnel packets destined for the MS to the PDIF (122), the PDIF and then forwards the packet to the MS. MS 는 이 동을 계속할 수도 있고, 결국 WLAN 커버리지 영역을 벗어나, 3G 네트워크에 의해 서비스되는 영역으로 이동할 수도 있다. MS may continue to move, eventually leaves the WLAN coverage area, it may move to an area served by a 3G network. 일단 3G 네트워크에 있으면, MS 는 PDSN (118) 과 점대점 프로토콜 (PPP) 커넥션을 확립한다. Once the 3G network, MS establishes a PDSN (118) and point-to-point protocol (PPP) connection. PPP 커넥션이 확립된 이후에, PDSN (118) 은 그 CoA 를 MS 에 광고하기 위해서 FA 의 역할을 할 수도 있다. After the PPP connection is established, PDSN (118) may act as an FA to advertise its CoA to the MS. MS 가 WLAN 시스템에서 MIPv4 세션을 개시하는 경우, HA 에 의해 홈 어드레스 (HoA) 가 동적으로 할당되어야 한다. When the MS initiates a session in the WLAN system, MIPv4, to be a home address (HoA) by the HA dynamically allocated. 현재, HA 에 의해 HoA 를 MS 에 동적으로 할당하기 위한 방법 및 장치에 대한 필요성이 있다. At present, there is a need for a method and apparatus for dynamic allocation of a HoA to the MS by the HA. 터널 내부 어드레스를 요구하기 위해서 모바일 장치로부터 네트워크 장치로 키 인가 요구를 송신하는 단계; Sending a key is requested from the mobile device to the network device to request a tunnel inner address; 임시 어드레스를 모바일 장치에 할당하는 단계; Assigning a temporary address to the mobile device; 임시 어드레스를 모바일 장치로 송신하는 단계; Transmitting the temporary address to the mobile device; 모바일 장치에 대한 보안 정책 데이터베이스를 생성하는 단계; Generating a security policy database for mobile devices; 외부 에이전트로부터 모바일 장치로 에이전트 광고를 송신하는 단계; Sending an agent advertisement to the mobile device from an external agent; 모바일 장치로부터 외부 에이전트로 등록 요구를 송신하는 단계; Sending a registration request to the foreign agent from a mobile device; 등록 요구에 포함된 정보를 이용하여 보안 정책 데이터베이스를 변경하는 단계; Steps to change the security policy database using the information contained in the registration request; 홈 에이전트에 의해 홈 어드레스를 모바일 장치에 할당하는 단계; Assigning a home address to the mobile device by the home agent; 및 선택자로서 모바일 장치의 홈 어드레스만을 포함하도록 보안 정책 데이터베이스를 변경하는 단계를 포함하는 방법. And a selector comprising the step of changing the security policy database to include only the home address of the mobile device. 터널 내부 어드레스를 요구하기 위해서 모바일 장치로부터 네트워크 장치로 키 인가 요구를 송신하는 단계; Sending a key is requested from the mobile device to the network device to request a tunnel inner address; 임시 어드레스를 모바일 장치에 할당하는 단계; Assigning a temporary address to the mobile device; 임 시 어드레스를 모바일 장치로 송신하는 단계; Transmitting the temporary address to the mobile device; 모바일 장치에 대한 보안 정책 데이터베이스를 생성하는 단계; Generating a security policy database for mobile devices; 외부 에이전트로부터 모바일 장치로 에이전트 광고를 송신하는 단계; Sending an agent advertisement to the mobile device from an external agent; 모바일 장치로부터 외부 에이전트로 등록 요구를 송신하는 단계; Sending a registration request to the foreign agent from a mobile device; 등록 요구에 포함된 정보를 이용하여 보안 정책 데이터베이스를 변경하는 단계; Steps to change the security policy database using the information contained in the registration request; 홈 에이전트에 의해 홈 어드레스를 모바일 장치에 할당하는 단계; Assigning a home address to the mobile device by the home agent; 선택자로서 모바일 장치의 홈 어드레스만을 포함하도록 보안 정책 데이터베이스를 변경하는 단계; The step of changing the security policy database, a selector to include only the home address of the mobile device; 및 모바일 장치에 대한 부가적인 선택자로서 외부 터널의 송신지 인터넷 프로토콜 어드레스를 포함하도록 보안 정책 데이터베이스를 변경하는 단계를 포함하는 방법. And a method comprising the step of changing the security policy database to include a transmission if the Internet Protocol address of the outer tunnel as an additional selector for the mobile device. 터널 내부 어드레스를 요구하기 위해서 모바일 장치로부터 네트워크 장치로 키 인가 요구를 송신하기 위한 송신기; A transmitter for transmitting a key is requested from the mobile device to the network device to request a tunnel inner address; 네트워크 장치로부터 임시 어드레스를 수신하기 위한 수신기; A receiver for receiving a temporary address from the network device; 모바일 장치에 대한 보안 정책 데이터베이스를 생성하기 위한 프로세서; A processor for generating a security policy database for mobile devices; 모바일 장치로부터 외부 에이전트로 등록 요구를 송신하기 위한 송신기; A transmitter for transmitting a registration request to the foreign agent from a mobile device; 및 홈 어드레스를 수신하기 위한 수신기와 같은 구성요소를 포함하는 장치. Device including a component such as a receiver for receiving and home address. 모바일 장치로부터 키 인가 요구를 수신하기 위한 수신기; A receiver for receiving a key is requested from the mobile device; 임시 어드레스를 저장하기 위한 프로세서; A processor for storing the temporary address; 임시 어드레스를 모바일 장치로 송신하기 위한 송신기; A transmitter for transmitting the temporary address to the mobile device; 및 보안 정책 데이터베이스를 생성 및 변경하기 위한 프로세서와 같은 구성요소를 포함하는 장치. And the device includes components, such as a security policy database and a processor for generating and changing. 터널 내부 어드레스를 요구하기 위해서 모바일 장치로부터 네트워크 장치로 키 인가 요구를 송신하기 위한 수단; It means for sending a key is requested from the mobile device to the network device to request a tunnel inner address; 임시 어드레스를 모바일 장치에 할당하기 위한 수단; It means for allocating a temporary address to the mobile device; 임시 어드레스를 모바일 장치로 송신하기 위한 수단; It means for transmitting the temporary address to the mobile device; 모바일 장치에 대한 보안 정책 데이터베이스를 생성하기 위한 수단; It means for creating a security policy database for mobile devices; 외부 에이전트로부터 모바일 장치로 에이전트 광고를 송신하기 위한 수단; It means for transmitting an agent advertisement to the mobile device from an external agent; 모바일 장치로부터 외부 에이전트로 등록 요구를 송신하기 위한 수단; It means for sending a registration request to the foreign agent from a mobile device; 등록 요구에 포함된 정보를 이용하여 보안 정책 데이터베이스를 변경하기 위한 수단; It means for changing the security policy database using the information contained in the registration request; 홈 에이전트에 의해 홈 어드레스를 모바일 장치에 할당하기 위한 수단; It means for assigning a home address to the mobile device by the home agent; 및 선택자로서 모바일 장치의 홈 어드레스만을 포함하도록 보안 정책 데이터베이스를 변경하기 위한 수단과 같은 구성요소를 포함하는 장치. And a selector device including a component such as a means to change the security policy database to include only the home address of the mobile device. 터널 내부 어드레스를 요구하기 위해서 모바일 장치로부터 네트워크 장치로 키 인가 요구를 송신하는 단계; Sending a key is requested from the mobile device to the network device to request a tunnel inner address; 임시 어드레스를 모바일 장치에 할당하는 단계; Assigning a temporary address to the mobile device; 임시 어드레스를 모바일 장치로 송신하는 단계; Transmitting the temporary address to the mobile device; 모바일 장치에 대한 보안 정책 데이터베이스를 생성하는 단계; Generating a security policy database for mobile devices; 외부 에이전트로부터 모바일 장치로 에이전트 광고를 송신하는 단계; Sending an agent advertisement to the mobile device from an external agent; 모바일 장치로부터 외부 에이전트로 등록 요구를 송신하는 단계; Sending a registration request to the foreign agent from a mobile device; 등록 요구에 포함된 정보를 이용하여 보안 정책 데이터베이스를 변경하는 단계; Steps to change the security policy database using the information contained in the registration request; 홈 에이전트에 의해 홈 어드레스를 모바일 장치에 할당하는 단계; Assigning a home address to the mobile device by the home agent; 및 선택자로서 모바일 장치의 홈 어드레스만을 포함하도록 보안 정책 데이터베이스를 변경하는 단계를 수행하기 위한 컴퓨터 실행가능 명령어들을 포함하는 컴퓨터-판독가능 매체. And a selector computer including computer-executable instructions for performing the step of changing the security policy database to include only the home address of mobile device-readable media. 터널 내부 어드레스를 요구하기 위해서 모바일 장치로부터 네트워크 장치로 키 인가 요구를 송신하는 단계; Sending a key is requested from the mobile device to the network device to request a tunnel inner address; 임시 어드레스를 모바일 장치에 할당하는 단계; Assigning a temporary address to the mobile device; 임시 어드레스를 모바일 장치로 송신하는 단계; Transmitting the temporary address to the mobile device; 모바일 장치에 대한 보안 정책 데이터베이스를 생성하는 단계; Generating a security policy database for mobile devices; 외부 에이전트로부터 모바일 장치로 에이전트 광고를 송신하는 단계; Sending an agent advertisement to the mobile device from an external agent; 모바일 장치로부터 외부 에이전트로 등록 요구를 송신하는 단계; Sending a registration request to the foreign agent from a mobile device; 등록 요구에 포함된 정보를 이용하여 보안 정책 데이터베이스를 변경하는 단계; Steps to change the security policy database using the information contained in the registration request; 홈 에이전트에 의해 홈 어드레스를 모바일 장치에 할당하는 단계; Assigning a home address to the mobile device by the home agent; 선택자로서 모바일 장치의 홈 어드레스만을 포함하도록 보안 정책 데이터베이스를 변경하는 단계; The step of changing the security policy database, a selector to include only the home address of the mobile device; 및 모바일 장치에 대한 부가적인 선택자로서 외부 터널의 송신지 인터넷 프로토콜 어드레스를 포함하도록 보안 정책 데이터베이스를 변경하는 단계를 수행하기 위한 컴퓨터-판독가능 명령어들을 포함하는 컴퓨터-판독가능 매체. And additional selector as a computer for performing the step of changing the security policy database to include the Internet Protocol address of the destination it outside the tunnel to the mobile device-readable medium of a computer that includes a readable instructions. 도 2 는 본 발명의 일 실시형태에 따른 모바일 IPv4 의 동작을 도시한 도면이다. 2 is a diagram illustrating the operation of the Mobile IPv4 according to an embodiment of the present invention. 도 3 은 본 발명의 일 실시형태에 따른 보안 게이트웨이-보안 게이트웨이 터널을 도시한 도면이다. 3 is a security gateway according to an embodiment of the invention - a diagram showing the security gateway tunnel. 도 4 는 본 발명의 일 실시형태에 따른 종단점-종단점 전송을 도시한 도면이다. Figure 4 is an endpoint in accordance with one embodiment of the invention - a diagram showing the transmission end point. 도 5 는 본 발명의 일 실시형태에 따른 종단점-보안 게이트웨이 터널 전송을 도시한 도면이다. 5 is a end-point in accordance with one embodiment of the invention - a diagram showing the security gateway tunnel transmission. 도 6 은 본 발명의 일 실시형태에 따른 터널 확립 흐름을 도시한 도면이다. Figure 6 is a diagram illustrating a tunnel establishment flow according to an embodiment of the present invention. 도 7 은 본 발명의 일 실시형태에 따른 홈 에이전트에 의한 동적 홈 어드레 스 할당을 도시한 흐름도이다. 7 is a flow chart of a dynamic groove eodeure's assigned by the home agent in accordance with one embodiment of the invention. "대표적인" 이라는 단어는 본 명세서에서 "실시예, 실례 또는 예시의 역할을 하는 것"을 의미하는데 이용된다. The word "exemplary" is used to mean "an embodiment, serving as an instance or illustration" in the present specification. 본 명세서에서 "대표적인" 것으로서 기재된 어떠한 실시형태는 반드시 다른 실시형태에 비해 바람직하거나 이로운 것으로서 구성되는 것은 아니다. Any embodiment described as "exemplary" as used herein is not necessarily to be construed as preferred or advantageous over other embodiments. MIPv4 는 인터넷에서의 모바일 노드에 대한 IP 데이터그램의 투명적 라우팅을 허용한다. MIPv4 allows the enemy transparent routing of IP datagrams to mobile nodes in the Internet. 각 모바일 노드는, 현재의 인터넷 연결 지점에 관계없이, 항상 그 홈 어드레스에 의해 식별된다. Each mobile node, regardless of the current Internet connection point, is always identified by its home address. 그 홈으로부터 벗어나 있는 동안, 모바일 노드는 또한 CoA 와도 연관되는데, 이는 모바일 노드의 현재의 인터넷 연결 지점에 대한 정보를 제공한다. While away from its home, a mobile node is also associated vorticity there is CoA, which provides information about your current Internet connection point of the mobile node. MIPv4 는 CoA 를 HA 에 등록하기 위한 메커니즘 및 절차를 제공한다. MIPv4 provides a mechanism and procedure for registering the CoA to the HA. HA 는 모바일 노드로 향하는 데이터그램을 터널을 통해 CoA 로 송신한다. HA is sent to the CoA via tunnel a datagram destined for the mobile node. 터널을 통과한 이후에, 데이터그램은 모바일 노드로 전달된다. After passing through the tunnel, the datagram is transmitted to the mobile node. MIPv4 는, 모바일 노드의 IP 어드레스가 인터넷에 대한 모바일 노드의 연결 지점을 고유하게 식별한다고 가정한다. MIPv4 is assumed that the IP address of the mobile node to uniquely identify the connection point of the mobile node to the Internet. 모바일 노드는, 모바일 노드로 향하는 데이터그램을 수신하기 위해서 그 IP 어드레스에 의해 식별되는 네트워크 상에 위치되어야 하고, 만약 그렇지 않으면, 데이터그램은 전달불가능하다. The mobile node, to receive a datagram destined for the mobile node to be placed on the network, identified by its IP address, if it does not, the datagram is not passed. 모바일 노드는, 통신 능력을 상실하지 않으면서 그 연결 지점을 유지하기 위해서 다음의 메커니즘 중 하나의 메커니즘을 이용할 수도 있다. The mobile node, in order to maintain the connection point without losing the ability to communicate may utilize one of the mechanisms of the following mechanisms: 첫번째 방법은, 모바일 노드 가 인터넷에 대한 연결 지점을 변경할 때마다, 모바일 노드가 그 IP 어드레스를 변경해야만 하는 것을 필요로 한다. The first method, each time a mobile node changes the point of attachment to the Internet, and requires that the mobile node must change its IP address. 대안적으로, 모바일 노드는, 다수의 인터넷 라우팅 구조 전체에 걸쳐 전파되는 호스트-특정 경로를 이용해야만 한다. Alternatively, the mobile node, the host to be propagated throughout the plurality of Internet routing structure must use a specific path. 이들 선택사양은 모두 수락불가능하다고 판명될 수도 있다. These options may be turned out to be impossible to accept both. IP 어드레스를 반복적으로 변경하는 것은, 모바일 노드가 위치를 변경함에 따라, 모바일 노드가 전송 및 그 상위 계층 커넥션을 유지하는 것을 불가능하게 할 수도 있다. Changing the IP address repeatedly, as the mobile node changes the location, the mobile node may make it impossible to maintain the transport and higher layers connections. 두번째 방법은 어려운 스케일링 문제점을 야기시킬 수도 있다. The second method may cause a difficult scaling problems. MIPv4 는 인터넷 내에서 모바일 노드 이동성을 수용하기 위한 프로토콜이다. MIPv4 is a protocol for receiving a mobile node mobility within the Internet. 모바일 인터넷 프로토콜은 후술하는 바와 같은 새로운 기능 실체를 도입한다. Mobile Internet Protocol introduces a new functional entity that will be described later. 모바일 노드는 하나의 네트워크 또는 서브네트워크로부터 또 다른 네트워크 또는 서브네트워크로 그 연결 지점을 변경하는 라우터 또는 호스트이다. The mobile node is a host or router that changes its point of connection from one network or subnetwork to another network or subnetwork. 모바일 노드는 그 IP 어드레스를 변경하지 않으면서 그 위치를 변경할 수도 있는데, 이는, 연결 지점에 대한 링크 계층 접속성이 이용가능한 경우, 모바일 노드로 하여금 고정 IP 어드레스를 이용하여 어떠한 위치에서도 다른 인터넷 노드와 통신하는 것을 계속하도록 한다. The mobile node There may change its location without changing its IP address, which, if the link-layer connectivity to the connection point available, allows the mobile node and other Internet nodes at any location using a static IP address and to continue to communicate. 홈 에이전트는, 모바일 노드에 대한 현재의 위치 정보를 유지하고, 모바일 노드가 홈으로부터 벗어나 있는 경우에 모바일 노드에 대한 전달을 위해 데이터그램을 터널링하는 모바일 노드의 홈 네트워크 상의 라우터이다. The home agent maintains the current location information for the mobile node, a router on the home network of the mobile node that tunnels datagrams for delivery to the mobile node when the mobile node is away from home. 외부 에이전트는, 등록 중에 라우팅 서비스를 모바일 노드로 제공하는 모바 일 노드의 방문 네트워크 상의 라우터이다. The foreign agent is a router on a mobile node's visited network which provides routing services to the mobile node while registered. 외부 에이전트는, 모바일 노드의 홈 에이전트에 의해 터널링되었던 모바일 노드에 대한 데이터그램을 터널링해제 (detunneling) 하여, 모바일 노드로 전달한다. The foreign agent, the release (detunneling) tunneling datagrams for the mobile node that were tunneled by the home agent of the mobile node, and transmits to the mobile node. 외부 에이전트는 모바일 노드에 의해 송신된 데이터그램에 대하여 등록 모바일 노드를 위한 디폴트 라우터의 역할을 할 수도 있다. The foreign agent may serve as a default router for registered mobile nodes for a datagram transmitted by the mobile node. 모바일 노드에는 홈 네트워크 상의 장기 (long-term) IP 어드레스가 부여된다. The mobile node is given a long groove (long-term) IP address on the network. 이 홈 어드레스는 고정 호스트를 위한 "영구" IP 어드레스와 같이 관리된다. This home address is administered as "permanent" IP address to the stationary host. 모바일 노드가 그 홈 네트워크로부터 벗어나 있는 경우, CoA 가 모바일 노드와 연관되어, 인터넷에 대한 모바일 노드의 현재의 연결 지점을 반영한다. If the mobile node away from its home network, the CoA is associated with the mobile node and reflects the mobile node's current point of attachment to the Internet. 모바일 노드는, 본 발명에 독립적인 어떤 이동성 관리 기능 데이터그램만을 제외하고는, 모바일 노드가 송신하는 모든 IP 데이터그램의 송신지 어드레스로서 그 홈 어드레스를 이용한다. The mobile node, except for the mobility management functions independent of any datagram to the present invention and is used as an address to the home address if the transmission of all the IP datagrams transmitted by the mobile node. 모바일 IPv4 는 프로토콜의 동작을 리뷰하기 이전에 정의되어야 하는 다수의 용어를 이용한다. Mobile IPv4 uses a number of terms to be defined prior to review the operation of the protocol. 이들 용어는 아래에 정의된다. These terms are defined below. 에이전트 광고는, 특수 확장자를 라우터 광고 메시지에 부가함으로써 구성된 광고 메시지이다. Agent advertisement is an advertisement message constructed by adding a special extension in the router advertisement message. 인증은 메시지의 발신자의 식별자 (identity) 를 검증하기 위해서 암호화 기술을 이용하는 프로세스이다. Authentication is the process of using cryptographic techniques to verify the sender of the message identifier (identity). CoA 는, 모바일 노드가 그 홈 네트워크로부터 벗어나 있는 동안에 모바일 노드로 포워딩되는 데이터그램에 대해 모바일 노드로 향하는 터널의 종단점이다. CoA is an end point of a tunnel toward a mobile node for datagrams forwarded to the mobile node while the mobile node away from its home network. 프로토콜은 2 가지 상이한 타입의 CoA, 즉 모바일 노드가 등록되는 외부 에이전트의 어드레스인 외부 에이전트 CoA, 및 모바일 노드가 자신의 네트워크 인터페이스 중 하나의 인터페이스와 연관되었던 외부적으로 획득된 로컬 어드레스인 공존 (co-located) CoA 를 이용할 수도 있다. The protocol of the two different types of CoA, namely the co-mobile node is the address of the foreign agent is registered foreign agent CoA, and the mobile node has a local address obtaining externally was associated with a single interface of their own network interface (co -located) may use the CoA. 홈 어드레스는, 확장된 시간 주기 동안 모바일 노드에 할당되는 IP 어드레스이다. Home address is an IP address allocated to the mobile node for an extended period of time. 이는, 모바일 노드가 인터넷에 연결되는 위치에 관계없이 변경되지 않은 채로 유지된다. This is because a mobile node is kept unchanged regardless of where the connection to the Internet. 홈 네트워크는, 모바일 노드의 홈 어드레스의 네트워크 프리픽스 (prefix) 에 부합하는 네트워크 프리픽스를 갖는 네트워크이다. The home network is a network having a network prefix conforming to the home address of the mobile node, the network prefix (prefix). 표준 IP 라우팅 메커니즘은 모바일 노드의 홈 어드레스로 향하는 데이터그램을 모바일 노드의 홈 네트워크로 전달할 것이다. Standard IP routing mechanisms will deliver datagrams destined to the home address of the mobile node to the home network of the mobile node. 터널은, 데이터그램이 캡슐화되는 동안에 데이터그램이 따르는 경로이다. The tunnel is the path followed by a datagram while the datagram encapsulated. 캡슐화되는 동안에, 데이터그램은, 데이터그램을 캡슐화해제한 다음에, 이를 그 최종 수신지로 올바르게 전달하는 지식성 (knowledgeable) 캡슐화해제 에이전트로 라우팅된다. While the encapsulated, a datagram is a release encapsulated datagram to the next, it is routed to the knowledge property (knowledgeable) decapsulation agent to properly transfer Jiro that last received. 가상 네트워크는, 또 다른 네트워크에 대한 물리적 네트워크 인터페이스를 갖는 라우터 이외에는 물리적 설비를 갖지 않는 네트워크이다. Virtual networks, unless a further router having a physical network interface to the other network, the network does not have a physical facility. 라우터 또는 HA 는 일반적으로 종래의 라우팅 프로토콜을 이용하여 가상 네트워크에 대한 도달가능성을 광고한다. HA is a router or generally using conventional routing protocols to advertise reachability to the virtual network. 방문 네트워크는, 모바일 노드가 현재 접속되어 있는 모바일 노드의 홈 네트 워크와는 별개의 네트워크이다. Visited network, the home network of the mobile node that the mobile node is currently attached is a separate network. 모바일 IP 는 후술되는 지원 서비스를 제공한다. Mobile IP provides support services below. 홈 에이전트 및 외부 에이전트가 이들이 서비스를 제공하는 각 링크에 대한 그 이용가능성을 광고하는 경우에 에이전트 검색이 일어난다. Home Agent and Foreign Agent is an agent search advertising occurs when the availability of each link for which they provide services. 신규 도달 모바일 노드는, 어떠한 예상된 에이전트가 존재하는지를 확인하기 위해서 각 링크에 대한 요청 (solicitation) 을 송신할 수도 있다. New reach the mobile node, in order to determine if any expected agents there may transmit the request (solicitation) for each link. 모바일 노드가 홈 네트워크로부터 벗어나는 경우에 등록이 일어난다. The registration takes place when the mobile node escapes from the home network. 홈 네트워크로부터 벗어난 모바일 노드는 그 CoA 를 그 홈 에이전트에 등록한다. Mobile node out from the home network, and registers the CoA in the home agent. 인터넷에 대한 연결 지점에 종속하여, 모바일 노드는 직접적으로 또는 홈 에이전트로 등록을 포워딩하는 외부 에이전트를 통해 그 홈 에이전트에 등록할 것이다. And subject to the point of attachment to the Internet, the mobile node will register in its home agent via a foreign agent, which forwards the registration to the home agent directly or. 다음의 단계는 모바일 IP 프로토콜의 동작의 일반적인 윤곽을 제공한다. The following steps provide a general outline of the operation of the Mobile IP protocol. 이동성 에이전트, 즉 외부 에이전트 및 홈 에이전트는 에이전트 광고 메시지를 이용하여 그 프레즌스 (presence) 를 광고한다. Mobility agent, i.e., the foreign agent and the home agent by using the agent advertisement message to advertise its presence (presence). 또한, 모바일 노드는 에이전트 요청 메시지를 이용하여 어떠한 로컬 연결된 이동성 에이전트로부터의 에이전트 광고 메시지를 요청할 수도 있다. In addition, the mobile node may request an agent advertisement message from the local mobility agent, any agent associated with the request message. 모바일 노드는 에이전트 광고를 수신하여, 모바일 노드가 그 홈 네트워크 상에 있는지 또는 외부 네트워크 상에 있는지를 판정한다. The mobile node determines whether to receive the agent advertisement, the mobile node on the foreign network or that on its home network. 홈 네트워크 상에 있다고 모바일 노드가 검출한 경우에는, 모바일 노드는 이동성 서비스를 이용하지 않으면서 동작한다. If the mobile node detects that on the home network, the mobile node is operated without using the mobility service. 모바일 노드가 다른 장소에서 등록된 이후에 홈 네트워크로 복귀하는 경우에는, 모바일 노드는 먼저 등록 요구를 이용하고 등록 응답 메시지를 수신함으로써 홈 에이전트에 대해 등록해제한다. If the mobile node has returned to the home network after the registration in the other places, the mobile node first release using a registration request and registration for a home agent, by receiving a registration reply message. 홈 네트워크로부터 외부 네트워크로 이동하였다고 모바일 노드가 검출한 경우에는, 모바일 노드는 외부 네트워크에 대한 CoA 를 획득한다. Has moved from the home network to the external network when the mobile node is detected, the mobile node obtains a CoA for the external network. CoA 는, 외부 에이전트의 광고로부터 결정되는 것 (외부 에이전트 CoA) 또는 외부 할당 메커니즘에 의해 결정되는 것 (공존 CoA) 중 어느 하나의 어드레스일 수도 있다. CoA is, it may be any one that is determined from the advertisement of a foreign agent (the foreign agent CoA) or that (co-CoA), which is determined by an external assignment mechanism, one address. 그런 다음, 홈 네트워크로부터 벗어나 동작하는 모바일 노드는 등록 요구 메시지 및 등록 응답 메시지의 교환을 통해 새로운 CoA 를 홈 에이전트에 등록한다. Then, the mobile node operating away from the home network and registers the new CoA through the exchange of registration request messages and registration reply messages to the home agent. 이것이 일어난 이후에, 모바일 노드의 홈 어드레스로 송신된 데이터그램은 홈 에이전트에 의해 가로채기되어, 홈 에이전트에 의해 모바일 노드의 CoA 로 터널링되고, (외부 에이전트 또는 모바일 노드 중 어느 하나의) 터널 종단점에서 수신되고, 최종적으로 모바일 노드로 전달된다. After this takes place, the datagram is sent to the home address of the mobile node is interception by the home agent and tunneled to the CoA of the mobile node by the home agent, in (any one of the foreign agent or the mobile node), the tunnel end point It is received, and is finally delivered to the mobile node. 반대 방향으로, 모바일 노드에 의해 송신된 데이터그램은 일반적으로 표준 IP 라우팅 메커니즘을 이용하여 그 수신지로 전달되고, 반드시 홈 에이전트를 통과하지는 않을 수도 있다. In the opposite direction, transmitted by the mobile node, datagrams are typically using a standard IP routing mechanism is transmitted to the receiving Jiro, and may not necessarily pass through the home agent. 홈 네트워크로부터 벗어나 있는 경우, 모바일 IP 는, 모바일 노드의 홈 어드레스가 홈 네트워크와 모바일 노드의 현재의 위치 사이에 라우터를 개입시키는 것을 숨기기 위해서 프로토콜 터널링을 이용한다. If the departure from the home network, the mobile IP is used for tunneling protocol to hide to the home address of the mobile node via a router between the current position of the home network and the mobile node. 터널은 모바일 노드의 CoA 에서 종단된다. The tunnel is terminated at the CoA of the mobile node. CoA 는 종래의 IP 라우팅을 통해 데이터그램이 전달될 수도 있는 어드레스이어야 한다. CoA is to be an address, which may be a datagram passes through a conventional IP routing. CoA 에서, 오리지널 데이터그램이 터널로부터 제거되어, 모바일 노드로 전달된다. In the CoA, be removed from the original datagram tunnel, it is transmitted to the mobile node. 모바일 IPv4 는 CoA 를 획득하기 위한 2 가지 메커니즘을 제공한다. Mobile IPv4 provides two mechanisms for acquiring the CoA. 제 1 메커니즘에 있어서, 외부 에이전트 CoA 는 에이전트 광고 메시지를 통해 외부 에이전트에 의해 제공되는 CoA 이다. In the first mechanism, a foreign agent CoA is a CoA provided by a foreign agent via an agent advertisement message. 이 메커니즘에 있어서, CoA 는 외부 에이전트의 IP 어드레스이다. In this mechanism, CoA is an IP address of the foreign agent. 외부 에이전트가 터널링된 데이터그램을 수신하는 경우, 외부 에이전트는 이들을 캡슐화해제하여, 그 내부 데이터그램을 모바일 노드로 전달한다. When receiving a datagram the foreign agent is tunneling, the foreign agent will release by encapsulating them, and delivers the datagrams to the mobile node therein. 이 메커니즘은 선호되는데, 그 이유는 이 메커니즘이 다수의 모바일 노드로 하여금 동일한 CoA 를 공유하도록 하고, 제한된 어드레스 공간에 대해 불필요한 요구를 제기하지 않기 때문이다. This mechanism there is preferred, because this mechanism allows a large number of mobile nodes to share the same CoA, do not pose any unnecessary demands on the limited address space. 제 2 메커니즘은 공존 CoA 를 제공한다. The second mechanism provides a co-CoA. 이 공존 CoA 는 몇몇 외부 수단을 통해 모바일 노드에 의해 로컬 IP 어드레스로서 획득된다. The co-CoA is obtained a local IP address by the mobile node through some external means. 그런 다음, 모바일 노드는 그 자신의 네트워크 인터페이스 중 하나의 인터페이스와 공존 CoA 를 연관시킨다. Then, the mobile node is associated with a single interface and coexistence CoA of its own network interfaces. 공존 CoA 는 모바일 노드에 의해 임시 어드레스로서 동적으로 할당될 수도 있고, 또는 외부 네트워크를 방문하는 동안에만 이용하기 위해서 모바일 노드에 의해 장기 어드레스로서 소유될 수도 있다. Co-CoA it may also be owned by the mobile node as the long-address in order to use only during a visit to a dynamic, or an external network may be assigned a temporary address by the mobile node. 공존 CoA 를 이용하는 경우, 모바일 노드는 터널의 종단점의 역할을 하고, 어드레스에 대해 터널링된 데이터그램의 캡슐화해제를 수행한다. When using a co-CoA, the mobile node performs a decapsulation of datagrams tunneled on, and address the role of a tunnel end-point. 이 메커니즘은 모바일 노드로 하여금 외부 에이전트 없이 기능하도록 하는 이점을 갖는다. This mechanism has the advantage of allowing the mobile node to function without a foreign agent. 이 메커니즘이 외부 네트워크 내의 어드레스의 저장소가 방문 모바일 노드에 대해 이용가능하게 되도록 하는 것을 필요로 하기 때문에, 이 메커니즘은 IPv4 어드레스 공간에 부담을 지울 수도 있다. Because of this mechanism is to require that the storage of the address in the external network so as to be available for the visiting mobile node, a mechanism is also clear the burden of the IPv4 address space. CoA 는 외부 에이전트 기능과 별개이다. CoA is independent of a foreign agent functionality. CoA 는 터널의 종단점이다. CoA is the end point of the tunnel. 이는 외부 에이전트의 어드레스일 수도 있지만, 모바일 노드에 의해 임시적으로 획득된 어드레스 (공존 CoA) 일 수도 있다. This may be an address (co-CoA) acquired by the temporary address may be a mobile node, but the external agent. 외부 에이전트는 모바일 노드로 서비스를 제공하는 이동성 에이전트이다. The foreign agent is a mobility agent that provides service to the mobile node. 도 2 는, 모바일 노드가 홈 에이전트에 등록한 이후에, 그 홈 네트워크로부터 벗어난 모바일 노드로의/노드로부터의 데이터그램의 라우팅을 도시한 도면이다. Figure 2 is a diagram showing a mobile node routing datagrams to / from a node of the mobile node out after the registration to the home agent, from its home network. 그 방법 (200) 은, 모바일 노드가 외부 에이전트 CoA 를 이용하는 것을 예시한다. The method 200, illustrate that the mobile node is using a foreign agent CoA. 모바일 노드에 대한 데이터그램은 표준 IP 라우팅을 이용하여 홈 네트워크 상의 호스트 (202) 에 도달한다. Datagrams for the mobile node reaches the host 202 on the home network using standard IP routing. 홈 에이전트 (204) 는 데이터그램을 가로채기하여, 이 데이터그램을 CoA 로 터널링한다. The home agent 204 to intercept the datagram will be tunneled to the datagram to the CoA. 외부 에이전트 (206) 는 이 데이터그램을 터널링해제하여, 이 데이터그램을 모바일 노드에 의해 송신된 데이터그램에 대한 모바일 노드 (208) 로 전달하는데, 표준 IP 라우팅은 각 데이터그램을 특정 수신지로 전달한다. The foreign agent 206 to release tunnels the datagrams, to deliver datagrams to the mobile node 208 to the datagram transmitted by the mobile node, standard IP routing transmits the respective datagram to a specific received . 도 2 에 있어서, 외부 에이전트는 모바일 노드의 디폴트 라우터이다. 2, the foreign agent is the default router of the mobile node. 홈 에이전트는, 등록된 임의의 모바일 노드의 홈 어드레스로 지정되는 데이터그램을 유인하여 가로채기할 수도 있어야 한다. The home agent, to attract a datagram that is specified as the home address of any registered mobile node should also be intercepted. 이 요건은, 홈 에이전트가 모바일 노드의 홈 어드레스에 의해 지시되는 링크에 대한 네트워크 인터페이스를 갖는 경우에 만족될 수도 있다. This requirement is, the home agent may be satisfied in the case of having a network interface on the link indicated by the home address of the mobile node. 또한, 모바일 노드에 관한 홈 에이전트의 다른 배치가 가능할 수도 있지만, 모바일 노드의 홈 어드레스로 지정되는 데이터그램을 가로채기하는 다른 방법이 요구될 수도 있다. In addition, although it possible for a different arrangement of a home agent of the mobile node, another method of intercepting a datagram that is specified as the home address of the mobile node may be required. 모바일 노드, 및 현재의 또는 예상된 외부 에이전트는, 표준 IP 라우팅 메커 니즘, 상세하게는 IP 헤더의 수신지 어드레스의 네트워크 프리픽스에 기초하여 포워딩 결정을 하도록 하는 표준 IP 라우팅 메커니즘에 종속하지 않으면서, 데이터그램을 교환할 수 있어야 한다. Without dependency on the mobile node, and the current or anticipated external agent, standard IP routing mechanisms, particularly standard IP routing mechanism to be a forwarding decision based on the network prefix of the destination address of the IP header, the data It must be able to exchange programs. 이는, 외부 에이전트 및 방문 모바일 노드가 동일한 링크에 대한 인터페이스를 갖는 경우에 달성될 수도 있다. This is because the foreign agent and the visiting mobile node can also be achieved in the case of having an interface to the same link. 이 경우, 모바일 노드 및 외부 에이전트는, 서로에 대해 데이터그램을 송신하고, 하위 링크-계층 패킷을 그 각각의 링크 계층 어드레스로 지정하는 때에 단순히 정규 IP 라우팅 메커니즘을 바이패스한다. In this case, the mobile node and the foreign agent transmits the datagram to one another, and the lower link-layer packet to simply bypass the normal IP routing mechanism, the time specified by each of the link-layer address. 모바일 노드가 공존 CoA 를 이용하는 경우에는, 모바일 노드는 이 CoA 의 네트워크 프리픽스에 의해 식별되는 링크 상에 있어야 한다. If the mobile node is using a co-CoA, the mobile node will be on the link identified by the network prefix of the CoA. 모바일 노드가 공존 CoA 를 이용하지 않는 경우에는, 데이터그램이 전달불가능하게 될 것이다. If the mobile node does not utilize a co-CoA is, will not be datagram delivery. 하나의 네트워크로부터 또 다른 네트워크로 이동하는 모바일 노드는, 모바일 노드에 어떻게 도달될 수도 있는지를 통신하기 위한 플렉시블 메커니즘을 필요로 한다. In addition to the mobile node moves to a foreign network from a single network, requiring a flexible mechanism for communicating how that may be reached at the mobile node. 이는 등록을 이용하여 모바일 IP 에서 달성된다. This is achieved using a register in the mobile IP. 등록은, 외부 네트워크를 방문하는 경우에 모바일 노드가 포워딩 서비스를 요구하고, 현재의 CoA 를 홈 에이전트에 통지하고, 대략 만료가 되는 등록을 갱신하고, 또한 모바일 노드가 홈으로 복귀하는 경우에 등록해제하는 방법이다. Registration is, when visiting a foreign network the mobile node requires a forwarding service to, and notifies the current CoA to the home agent, and updating the registration which is substantially expired, and also registered when the mobile node returns to the home off a method for. 등록 메시지는 모바일 노드, 외부 에이전트와 홈 에이전트 사이에서 정보를 교환한다. Registration messages exchange information between a mobile node, the foreign agent and the home agent. 등록 프로세스는, 홈 에이전트에서 바인딩되고, 특정 시간 주기 동안 모바일 노드의 홈 어드레스를 그 CoA 와 연관시키는 이동성을 생성 또는 변경한다. The registration process, and the binding in the home agent, the home address of the mobile node for a particular time period to produce or change the mobility of associating with the CoA. 모바일 IP 는 2 가지 상이한 등록 절차를 제공하는데, 그 중 하나의 등록 절 차는 정보를 모바일 노드의 홈 에이전트로 중계하는 외부 에이전트를 통하는 것이고, 또 다른 등록 절차는 모바일 노드의 홈 에이전트에 직접 등록하는 것이다. Mobile IP has two kinds to provide a different registration procedures, will either register section difference information of those passing through the foreign agent which relays the home agent of the mobile node, and another registration procedure to register directly to the home agent of the mobile node . 규칙은 주위 환경에 종속하여 어떤 절차가 이용되어야 하는지를 정의한다. Rules define how certain procedures should be used to depend on the surrounding environment. 각 등록 절차는 본 발명의 방법 및 장치와 호환된다. Each registration process is compatible with the method and apparatus of the present invention. 등록 절차는 인증 및 어느 정도의 보안을 제공하고, 터널링도 보안을 제공한다. The registration procedure provides authentication and a degree of security, and also provides a secure tunnel. 그럼에도 불구하고, 다중 네트워크를 통해 이동 중인 동안에 데이터그램을 보호하기 위해서 부가적인 보안이 필요하다. Nevertheless, the additional security is needed to protect a datagram while being moved through multiple networks. 모바일 IPv4 는 IKEv2 (Internet Key Exchange Version 2) 로서 공지된 키 교환 프로토콜과 관련하여 이용된다. Mobile IPv4 is used in relation to the key exchange protocol known as the IKEv2 (Internet Key Exchange Version 2). IKEv2 는 상호 인증의 수행, 및 보안 연관의 확립과 유지를 위해 이용되는 IP 보안 (IPsec) 의 구성요소이다. IKEv2 is a component of the IP security (IPsec) is used for performing the mutual authentication, and the establishment and maintenance of the security association. IPsec 는 IP 데이터그램에 대한 데이터 소스 인증, 액세스 제어, 데이터 무결성 및 비밀성을 제공한다. IPsec provides data source authentication, access control, data integrity, and confidentiality to IP datagrams. 이들 서비스는, IP 데이터그램의 싱크와 소스 사이에 공유 상태를 유지함으로써 제공된다. These services are provided by maintaining a shared state between the source and the sink of an IP datagram. 이 상태는, 암호화 알고리즘이 이용되는 데이터그램에 대해 제공되는 특정 서비스, 및 암호화 알고리즘에 대한 입력으로서 이용되는 키를 정의한다. This state defines the key to be used as input for a specific service, and encryption algorithms provided for the datagram that the encryption algorithm used. IKEv2 는, 이 상태가 동적으로 확립되도록 한다. IKEv2 is, so that the dynamic state is established. 모든 IKEv2 통신은 요구 및 응답의 메시지 쌍으로 이루어진다. All IKEv2 communications are made to the request and response message pairs. 이 메시지 쌍은 교환으로서 공지되어 있다. This message pair is known as an exchange. 요구 다음에 응답이 따른다. The answer depends on the following requirements. 이는 신뢰성을 보장하기 위한 요구자의 책임 (responsibility) 이다. This is the request of a liability (responsibility) to ensure reliability. 타임아웃 간격 내에 응답이 수신되지 않는 경우, 요구자는 요구를 재송신하거나 커넥션을 포기해야 한다. If a response is not received within the timeout interval, the requester must be given up or retransmitting the connection request. 첫번째 교환은 보안 연관을 위한 보안 파라미터를 교섭한다. The first exchange to negotiate security parameters for the security association. 두 번째 요구는 식별자를 송신하고, 2 개의 식별자에 대응하는 비밀 인식 (knowledge of the secrets) 을 검증하고, 보안 연관을 셋업한다. The second requirement is to verify the secret recognition (knowledge of the secrets) for transmitting the identifier and corresponding to the two identifiers, and set up a security association. IKE 는 다수의 상이한 시나리오에서 이용될 수도 있는데, 그 각각은 특수 요건을 갖는다. There, IKE may be used in a number of different scenarios, each of which has special requirements. IKE 는 보안 게이트웨이-보안 터널에 대하여 이용될 수도 있다. IKE security gateway - can also be used for the secure tunnel. 도 3 은 이 시나리오의 블록도이다. Figure 3 is a block diagram for this scenario. 이 시나리오에 있어서, 어떤 IP 커넥션의 종단점도 IPsec 을 구현하지 않지만, 이들 사이의 네트워크 노드는 라우팅의 부분에 대해 트래픽을 보호한다. In this scenario, does not implement any of the IPsec endpoint IP connection, the network node between them is to protect the traffic against a portion of the route. 보호는 종단점에 대해 투명하고, 처리를 위해 터널 종단점을 통해 패킷을 송신하는 정상 라우팅에 종속한다. Protection is dependent on the normal route for transmitting the packet through the tunnel end-point for a transparent, processing for the end point. 각 종단점은 그 "이면에서" 어드레스 세트를 통지하고, 패킷은, 내부 IP 헤더가 실제 종단점의 IP 어드레스를 포함하는 터널 모드로 송신된다. Each endpoint is notified of the set of addresses from the "back", and the packet is, the inner IP header is sent to the tunnel mode, including the IP address of the actual point of termination. 도 4 는 IP 커넥션의 양 종단점이 IPsec 을 구현하는 시나리오, 또는 종단점-종단점 시나리오를 도시한 도면이다. 4 is a scenario, or the end point to implement the IPsec end points of both IP connection - a diagram showing an end-point scenario. 전송 모드는 내부 IP 헤더 없이 이용된다. Transfer mode is used without the inner IP header. 내부 IP 헤더가 존재하는 경우, 내부 및 외부 어드레스는 동일하다. When the inner IP header is present, the internal and external addresses are the same. 한 쌍의 어드레스는 이 보안 연관에 의해 보호될 패킷에 대하여 교섭된다. A pair of address is negotiated with respect to the packets to be protected by the security association. 이들 종단점은 참가자의 IPsec 인증된 식별자에 기초한 응용 계층 액세스 제어를 구현할 수도 있다. These endpoints may implement the application layer access control based on the IPsec authenticated identifiers of the participants. 이 시나리오의 하나의 이점은, 이 시나리오가 단대단 보안을 제공한다는 것이다. One advantage of this scenario is that this scenario provides an end-to-end security. 도 5 는 종단점-보안 게이트웨이 터널 시나리오의 블록도이다. Figure 5 is an endpoint - a block diagram of a secure gateway tunnel scenario. 이 시나리오에 있어서, 보호된 종단점 (통상적으로, 휴대용 로밍 장치) 은 IPsec 보호된 터널을 통해 그 기업 네트워크에 접속한다. In this scenario, the protected end points (typically, a portable roaming device) is connected to the enterprise network through the IPsec tunnel protection. 이 장치 또는 모바일 노드는 기업 네트워크에 대한 정보에 액세스하는데만 이 터널을 이용할 수도 있고, 또는 이 장치 또는 모바일 노드는 기업 방화벽에 의해 제공되는 보호를 이용하기 위해서 기업 네트워크를 통해 그 모든 트래픽을 터널링할 수도 있다. The device or mobile node may only use the tunnels to access information on the corporate network, or a device or a mobile node to tunnel all traffic through the corporate network in order to use the protection provided by the corporate firewall may. 각 경우에, 보호된 종단점으로 리턴된 패킷이 보안 게이트웨이를 향하여 터널링되도록, 보호된 종단점은 보안 게이트웨이와 연관된 IP 어드레스를 갖기를 원할 것이다. In each case, so that the return to a protected end-point tunneling packet toward the security gateway, a protected end-point will want to have the IP address associated with the security gateway. 이 IP 어드레스는 고정될 수도 있고, 또는 보안 게이트웨이에 의해 동적으로 할당될 수도 있다. The IP address may be fixed, or may be dynamically assigned by the security gateway. 동적 할당을 지원하기 위해서, IKEv2 는 보안 할당의 지속기간 동안의 이용을 위해 보안 게이트웨이에 의해 소유된 IP 어드레스를 개시자가 요구하기 위한 메커니즘을 포함한다. In order to support dynamic assignment, IKEv2 includes a mechanism for the initiator needs the IP address owned by the secure gateway for use during the duration of the assigned security. 이 시나리오에 있어서, 패킷은 터널 모드를 이용한다. In this scenario, the packet is used in the tunnel mode. 보호된 종단점으로부터의 각 패킷에 대하여, 외부 IP 헤더는, 현재의 위치와 연관된 송신지 IP 어드레스 (즉, 종단점으로 직접 트래픽을 라우팅하는 어드레스) 를 포함하는 한편, 내부 IP 헤더는 보안 게이트웨이에 의해 할당된 송신지 IP 어드레스 (즉, 종단점으로의 포워딩을 위해 트래픽을 보안 게이트웨이로 포워딩하는 어드레스) 를 포함한다. For each packet from a protected end-point, the outer IP header, comprising a support transmission associated with the current location IP address (i.e., address to route traffic directly to the end point), while the inner IP header is assigned by the security gateway the destination includes an IP address (i.e., an address for forwarding the traffic to the secure gateway for forwarding to the end point). 외부 수신지 어드레스는 보안 게이트웨이의 어드레스인 한편, 내부 수신지 어드레스는 패킷에 대한 최종 수신지이다. External destination address is the address, while the internal destination address of the security gateway jiyida last received for the packet. 본 발명은 어떠한 이들 시나리오에 대하여 이용될 수도 있지만, 터널과 관련하여 동작하기에 적합하다. The present invention, but may be used for any of these scenarios, it is suitable for operating in conjunction with the tunnel. 모바일 IPv4 및 IKEv2 는 3G 시스템에 대하여 전술되었다. Mobile IPv4 and IKEv2 were described above with respect to 3G systems. 본 발명은, 모바일 노드가 3G 시스템으로부터 WLAN 으로 이동하는 경우에 발견되는 문제점을 해결한다. The present invention solves the problem that the mobile node is found when moving in the WLAN from the 3G system. cdma2000 IP 데이터 접속성과 관련하여 WLAN 네트워크의 개요가 제 공될 것이다. cdma2000 IP data connectivity and will have the outline of the WLAN network related gongdoel claim. 도 1 은 3G 홈 코어 네트워크와 인터페이스하도록 설계된 WLAN 네트워크의 일부를 도시한 도면이다. 1 is a view of a portion of a WLAN network that is designed to interface with home 3G core network. WLAN 실체와 인터페이스하는 3G 홈 코어 네트워크에서의 기능부는 PDIF 및 HA 를 포함한다. Functions in the 3G home core network that interfaces to the WLAN entities section comprises PDIF and HA. PDIF 는 패킷 데이터 상호연동 기능부로서, 비인가 액세스로부터 서비스 중인 cdma2000 네트워크의 자원 및 패킷 데이터 서비스를 보호하는 보안 게이트웨이의 역할을 한다. PDIF acts as a security gateway to a packet data inter-working function unit, the protection resources and packet data services in cdma2000 network that services from unauthorized access. PDIF (122) 는 서비스 중인 네트워크, 이 경우 3G 홈 코어 네트워크에 위치한다. PDIF (122) is located in the service network that is, in this case the home 3G core network. 또한, HA (124), 또는 홈 에이전트도 3G 홈 코어 네트워크에 위치한다. In addition, the HA (124), or home agent also located in the home 3G core network. PDIF (122) 는, 3G 홈 코어 네트워크 및 다른 외부 네트워크에 대한 IP 접속성을 제공함으로써, 패킷 데이터 서비스에 대한 액세스를 제공한다. PDIF (122) is, by providing IP connectivity to the home 3G core network and other external networks, and provides access to packet data services. PDIF 는, 터널의 확립 및 해제, 서비스 중인 네트워크로부터 MS 에 대한 IP 어드레스의 할당, 및 MS 또는 모바일 노드로의/노드로부터의 트래픽의 캡슐화 및 캡슐화해제를 포함하여, PDIF 와 모바일 노드 또는 이동국 (MS) 사이에 안전한 터널 관리 절차를 지원한다. PDIF, the establishment of the tunnel and released, the assignment of the IP address for the MS from the service that the network, and the MS or including the encapsulation and decapsulation of the traffic to / from a node of the mobile node, PDIF and the mobile node or the mobile station (MS ) supports a secure tunnel between the management process. 또한, 이는 패킷 필터링 및 라우팅과 같은 서비스 중인 네트워크 정책을 실시한다. In addition, this embodiment being a network service policies, such as packet filtering and routing. H-AAA (120) 에 대한 인터페이스를 통해, PDIF (122) 는 사용자 인증 및 인가 정책 정보의 전달을 지원한다. Via an interface to the H-AAA (120), PDIF (122) supports user authentication and transmission of the applied policy information. 부가적으로, PDIF (122) 는 계정 정보를 수집하여 보고한다. Additionally, PDIF (122) reports to collect account information. 전술한 바와 같이, 터널은 인터넷을 통해 데이터그램을 전달하기 위한 안전한 수단이다. As described above, the tunnel is a secure means for delivering a datagram over the Internet. 터널은 후술되는 절차를 이용하여 확립된다. The tunnel is established using the procedures described below. 도 6 은 터널 확립 절차에서의 메시지의 흐름을 도시한 도면이다. 6 is a view showing the flow of messages in the tunnel establishment procedure. 터널 의 확립을 시작하기 위해서, MS 또는 모바일 노드는 WLAN 액세스 네트워크에 대해 인증하고, 인터넷 액세스를 수신한다. In order to begin the establishment of a tunnel, MS or a mobile node authentication, and receives the Internet access to the WLAN access network. 이는 WLAN 액세스 네트워크가 인가를 위해 H-AAA 에 대하여 체크하는 것을 포함한다. This involves checking for the H-AAA to the WLAN access network is applied. MS 또는 모바일 노드는 액세스 네트워크로부터의 IP 어드레스를 구성하고, 디폴트 라우터 및 서버를 검색한다. MS or mobile node configure an IP address from the access network, retrieves a default router and a server. 그런 다음, MS 또는 모바일 노드는 PDIF 검색을 수행한다. Then, MS or mobile node performs PDIF search. PDIF IP 어드레스는 글로벌, 공개 라우팅가능한 IP 어드레스이다. PDIF IP address is an IP addressable global public routing. 그런 다음, MS 또는 모바일 노드는 PDIF 와의 IKEv2 교환을 개시한다. Then, MS or mobile node initiates the IKEv2 exchange with the PDIF. 제 1 메시지 세트는 키를 교환하는데 필요한 교환이다. A first set of messages is required to exchange the exchange key. 또한, 이들 교환은 데이터그램 포트 캡슐화의 교섭을 지원한다. Moreover, these exchange supports the negotiation of the encapsulated datagram port. 다음에, MS 또는 모바일 노드는 PDIF 와의 키 교환 인가를 개시한다. Next, MS or mobile node initiates the key exchange with the PDIF applied. 이들 메시지는 이전의 단계에서 교섭된 키를 이용하여 암호화 및 보호된다. These messages are encrypted and protected by the key negotiation in the previous steps. 그런 다음, MS 또는 모바일 노드는 터널 내부 IP 어드레스 (TIA) 를 요구한다. Then, MS or mobile node requests a tunnel inner IP address (TIA). MS 또는 모바일 노드는 서비스 인가 요구의 페이로드에 그 네트워크 액세스 식별자 (NAI) 를 포함시킨다. Thereby MS or the mobile node containing the Network Access Identifier (NAI) in the payload of the service is required. PDIF 는 IKE 인가 요구를 수신하고, 서비스 인가 및 사용자 인증을 요구하기 위해서 H-AAA 에 접촉한다. PDIF receives the IKE is required, and in contact with the H-AAA to request service authorization and user authentication. H-AAA 는 가입자를 인증하고, 인증 정보를 PDIF 로 포워딩한다. H-AAA authenticates the subscriber, and forwards the authentication information to the PDIF. PDIF 는 인가 메시지를 MS 또는 모바일 노드로 송신함으로써 IKE 인가 교환을 완료한다. PDIF completes the IKE exchange is applied by transmitting the message to the MS or the mobile node. 일단 이 IKE 인가가 완료되면, MS 또는 모바일 노드와 PDIF 사이에 IPsec 터널이 확립된다. Once the IKE application is completed, the IPsec tunnel is established between the MS or the mobile node and the PDIF. 도 7 은 3G-WLAN 상호연동에서의 홈 에이전트에 의한 동적 홈 어드레스 할당 의 흐름도이다. 7 is a flow chart of the dynamic home address allocated by the home agent in the 3G-WLAN inter-working. 도 7 에 있어서, 좌측 번호 (예를 들어, 1, 2, 3 등) 는 일반적으로 본 발명의 일 실시형태에 따른 3G-WLAN 상호연동 아키텍처에서의 홈 에이전트에 의한 동적 홈 어드레스 할당 방법의 단계를 언급한다. 7, the left number (e.g., 1, 2, 3, etc.) is usually a home agent dynamically step by the home address assignment method according to the present day 3G-WLAN inter according to an embodiment of the invention linkage architecture The mentioned. 단계 1 에서, 전술한 바와 같이, 터널 모드를 이용하는 경우에 IKEv2 동작을 위해 TIA 가 요구된다. In step 1, a TIA is required for operation in the case of using the IKEv2 tunnel mode, as described above. 이러한 요건 때문에, MS 또는 모바일 노드는 내부_IP4_어드레스를 0 으로 설정하여, TIA 를 MS 에 할당하도록 PDIF 로 시그널링한다. Because of these requirements, MS or mobile node to set the internal _IP4_ address to 0 will be signaled to the TIA PDIF to assign to the MS. 또한, MS 는, 전술한 MIPv4 FA CoA 동작을 MS 가 이용하길 원한다는 것을 나타내는 3GPP2-특정 파라미터를 포함시킨다. Further, MS is to include a parameter indicating that it wants a particular 3GPP2- want the MS using the MIPv4 FA CoA operation described above. 단계 2 에서, PDIF 는 임시 어드레스 (x) 를 MS 에 할당한다. In step 2, PDIF assigns a temporary address (x) to the MS. 이 어드레스는 나중에 단계 9 이후에 복구될 것이다. This address will be recovered after step 9 later. 단계 3 에서, PDIF 는 IKE 인가 응답 메시지로 임시 어드레스 (x) 를 MS 로 전달한다. In step 3, the PDIF sends the temporary address (x) is applied to the IKE reply message to the MS.
단계 4 에서, PDIF 는 MS 에 대한 보안 정책 데이터베이스 (SPD) 를 생성한다. 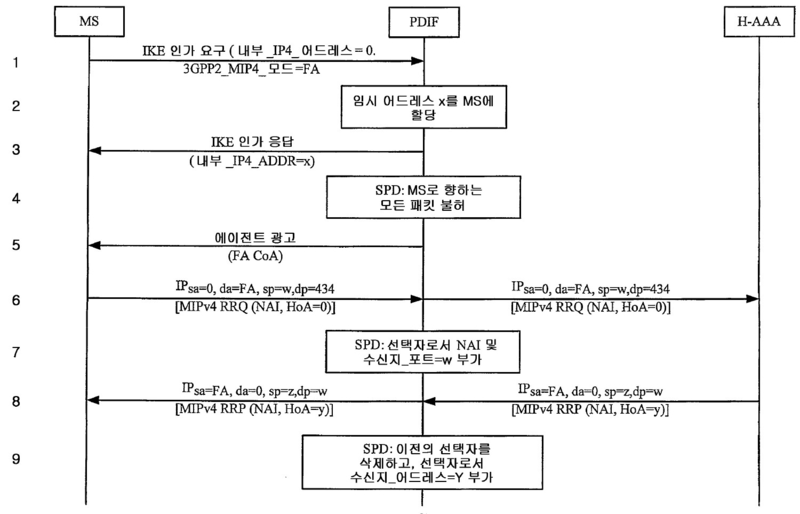 In step 4, PDIF creates a Security Policy Database (SPD) for MS. 이 때, 이 방법에서, SPD 의 정책은 임시 어드레스 (x) 로 향하는 모든 패킷을 불허하는 것이다. At this time, in this way, the SPD policy is to disallow any packet destined for the temporary address (x). 단계 5 에서, MS 가 MIPv4 FA CoA 동작을 이용할 것이다라는 것을 MS 가 나타내었기 때문에, PDIF 는 주기적으로 에이전트 광고를 MS 로 송신한다. In step 5, because the MS is eotgi MS is shown that would use the MIPv4 FA CoA operation, PDIF shall periodically transmit the agent advertisement to the MS. 에이전트 광고는 FA CoA 를 포함한다. The Agent Advertisement contains the FA CoA. 단계 6 에서, MS 는 MIPv4 등록 요구 (RRQ) 를 FA 로 송신한다. In step 6, the MS sends MIPv4 Registration Request (RRQ) to the FA. 송신지 및 수신지 IP 어드레스는 각각 0.0.0.0 및 FA CoA 이다. Transmitting resin and the destination IP address 0.0.0.0, and are each a FA CoA. 송신지 및 수신지 포 트 번호는 각각 (MS 에 의해 선택된) w 및 (MIPv4 등록에 대해 잘 알려진 포트인) 434 이다. Destination it and the destination port number is (in the well-known port for MIPv4 registration) 434, and each w (selected by the MS). RRQ 는 MS 의 NAI 를 포함하고, 홈 어드레스 (HoA) 필드는, HA 에 대해 HoA 를 할당하도록 하는 요구를 시그널링하기 위해서 0.0.0.0 과 동일하게 설정된다. RRQ including the NAI, and the home address (HoA) of the field, the MS is set in the same manner as in 0.0.0.0 to signal a request to allocate an HoA to the HA. 단계 7 에서, PDIF 는 선택자로서 MS 의 NAI 및 수신지 포트 (w) 를 부가함으로써 SPD 를 변경한다. In step 7, PDIF changes the SPD by adding the NAI and the destination port (w) of the MS as a selector. 이는, PDIF 로부터 MS 까지의 IPsec 터널과 MS 로 향하는 MIPv4 등록 응답 (RRP) 만을 PDIF 가 연관시킬 것이다라는 것을 의미한다. This means that only a MIPv4 Registration Response (RRP) destined for the IPsec tunnel with the MS to the MS from the PDIF the PDIF will associate. 이는 PDIF 로 하여금 RRP 를 올바른 IPsec 터널로 송신하도록 한다. This allows the PDIF to send the RRP to the correct IPsec tunnel. 단계 8 에서, HA 는 HoA (y) 를 할당하고, MS 의 NAI 도 포함하는 RRP 로 응답한다. In step 8, a HA is allocated HoA (y), and responds with an RRP to the MS includes the NAI. 송신지 및 수신지 IP 어드레스는 각각 HoA 및 CoA 이다. Destination it and the destination IP addresses are each HoA and CoA. 송신지 및 수신지 포트 번호는 각각 (HA 에 의해 선택된) z 및 w 이다. Destination it and the destination port number is the z and w respectively, (selected by the HA). 단계 9 에서, PDIF 는 선택자로서 수신지 어드레스 (y ; 즉, MS 의 HoA) 만을 포함시킴으로써 SPD 를 변경한다. In step 9, PDIF is a destination address as a selector; to change the SPD, by only including (y That is, the MS HoA). 이는, PDIF 로부터 MS 까지의 IPsec 터널과 MS 로 향하는 후속 IP 패킷을 PDIF 가 연관시킬 것이다라는 것을 의미한다. This is because the subsequent IP packets destined for the IPsec tunnel to the MS from the MS means that the PDIF the PDIF will associate. 이는 PDIF 로 하여금 패킷을 올바른 IPsec 터널로 송신하도록 한다. This allows the PDIF to send the packet to the correct IPsec tunnel. 부가적인 실시형태는 사설 어드레싱 지원을 허용한다. Additional embodiment allows for private addressing support. 즉, 각 HA 는 사설 어드레스를 할당할 수도 있고, 자신의 사설 어드레스 공간을 관리할 수도 있다. In other words, each of HA may be assigned a private address, it is also possible to control their own private address space. 이 실시형태에 있어서, 2 개의 HA 가 동일한 사설 어드레스를 동일한 PDIF 에 의해 서비스되는 상이한 MS 에 할당하는 것이 가능하다. In this embodiment, it is possible to two HA is assigned to the same private address to a different MS serviced by the same PDIF. 이러한 상황에 있어서, 2 개의 MS 를 대상으로 하는 2 개의 패킷이 동일한 수신지 IP 어드레스를 가지 기 때문에, PDIF 는 각 패킷에 대해 적절한 IPsec 터널을 결정해야만 한다. In such a situation, the two because the two packets that are destined for one MS have the same destination IP address, PDIF has to determine the appropriate IPsec tunnel for each packet. MS 로 향하는 각 IP 패킷은 IP-IP 캡슐화를 통해 MS 의 HA 로부터 PDIF 에 도달한다. Each IP packet destined for the MS reaches the PDIF HA from the MS via the IP-IP encapsulation. 이러한 상황에 있어서, 외부 패킷의 송신지 및 수신지 어드레스는 각각 HA 의 IP 어드레스 및 FA 의 IP 어드레스이다. In such a situation, if transmission of the packet and the destination external IP address is an address of the HA IP address and the FA, respectively. 내부 패킷의 송신지 및 수신지 어드레스는 각각 MS 의 IP 어드레스 및 대응 노드의 IP 어드레스이다. Transmitting resin and a destination address of the inner packet is the IP address of each MS and the IP address of the corresponding node. 2 개의 MS 가 동일한 사설 어드레스를 가짐에도 불구하고, 이들은 글로벌 라우팅가능한 상이한 HA IP 어드레스를 갖는데, 그 이유는 2 개의 MS 가 상이한 HA 에 의해 서비스되기 때문이다. Despite the two MS they are having the same private address, and these gatneunde different HA IP addressable global routing, since it is the two MS are served by a different HA. 추가적인 실시형태에 있어서, PDIF 는 MS 에 대한 SPD 에서의 부가적인 선택자로서 HA 의 IP 어드레스인 외부 터널의 송신지 IP 어드레스를 포함시킨다. In a further embodiment, PDIF causes an additional selector in the SPD for the MS if a transmission IP address of the external IP address of the HA tunnels. 이는 전술한 방법의 단계 9 를 변경한다. This changes the step 9 of the method described above. 이 실시형태에서의 단계 9 는, PDIF 가 사설 어드레스인 RRP (단계 8 참조) 에서의 할당된 HoA (즉, y) 를 검색하는 것을 필요로 한다. Step 9 in this embodiment, the PDIF needs to search for the HoA (i.e., y) is assigned a private address in the RRP (see step 8). 그런 다음, PDIF 는 MS 에 대한 SPD 에서의 부가적인 선택자로서 MS 의 HA IP 어드레스와 동일하게 설정되는 외부 터널의 송신지 IP 어드레스를 부가한다. Then, PDIF shall as an additional selector in the SPD for the MS adds the IP address of the destination it outside the tunnel that is set equal to the HA IP address of the MS.
추가적인 실시형태에 있어서, 본 발명이 속하는 기술분야에서 통상의 지식을 가진 자라면, 전술한 방법이 컴퓨터 플랫폼의 메모리와 같은 컴퓨터 판독가능 매체 상에 구체화된 프로그램을 실행함으로써 구현될 수 있다는 것을 인식할 것이다. In a further embodiment, be appreciated that the present Those invention with a conventional, in which, the above-described method can be implemented by executing a program embodied on a computer readable medium, such as the platform of the computer memory, will be. 명령어는 각종 타입의 신호-포함 (signal-bearing) 또는 데이터 저장 1 차, 2 차 또는 3 차 매체에 존재할 수 있다. Instruction signals of various types may be present to contain (signal-bearing) or data storage primary, secondary, or tertiary media. 매체는, 예를 들어, 클라이언트 장치 및/또 는 서버에 의해 액세스가능한, 또는 이러한 클라이언트 장치 및/또는 서버 내에 존재하는 RAM 을 포함할 수도 있다. Medium may, for example, the client device and / or may comprise a RAM existing in the accessible, or these client devices and / or servers by the server. RAM, 디스켓, 또는 다른 2 차 저장 매체에 포함되든지 간에, 명령어는, DASD 스토리지 (예를 들어, 종래의 "하드 드라이브" 또는 RAID 어레이), 자기 테이프, 전자식 읽기용 메모리 (예를 들어, ROM 또는 EEPROM), 플래시 메모리 카드, 광학 저장 장치 (예를 들어, CD-ROM, WORM, DVD, 디지털 광학 테이프), 종이 "천공" 카드, 또는 디지털 및 아날로그 전송 매체를 포함하는 다른 적합한 데이터 저장 매체와 같이, 각종 머신-판독가능 데이터 저장 매체에 저장될 수도 있다. Between doedeunji contained in RAM, a diskette, or other secondary storage media, the instructions, DASD storage (e.g., a conventional "hard drive" or a RAID array), for magnetic tape, electronic read-memory for (e.g., ROM or EEPROM), flash memory cards, an optical storage device (e. g., such as CD-ROM, WORM, DVD, digital optical tape), paper "punched" cards, or digital, and other suitable data storage media including analog transmission media , various machine-readable data may be stored in a storage medium. 전술한 설명은 본 발명의 예시적인 실시형태를 나타내지만, 첨부된 특허청구범위에 의해 정의된 바와 같은 본 발명의 범위를 벗어나지 않으면서 각종 변경 및 변형이 이루어질 수 있다는 것에 주목해야 한다. The foregoing description is to be noted that represents an exemplary embodiment of the present invention, and various changes and modifications may be made without departing from the scope of the invention as defined by the appended claims. 본 명세서에 기재된 본 발명의 실시형태에 따른 방법 청구항의 단계 또는 동작은 어떠한 특정 순서로 수행될 필요는 없다. Steps or actions of the method claims in accordance with embodiments of the invention described herein need not be performed in any particular order. 또한, 본 발명의 구성요소가 단수로 기재 또는 청구되어 있음에도 불구하고, 단수에 대한 제한이 명백히 언급되어 있지 않으면 복수로 간주된다. Further, the components of the present invention, although described or claimed in the singular, unless the limitation to the singular is not explicitly stated to be regarded as a plurality. 이와 같이 본 발명의 바람직한 실시형태가 설명되었다. Thus, the preferred embodiments of the invention have been described. 그러나, 본 발명의 사상 또는 범위를 벗어나지 않으면서 본 명세서에 기재된 실시형태에 대해 다수의 변경이 이루어질 수도 있다는 것은 본 발명이 속하는 기술분야에서 통상의 지식을 가진 자에게 자명하다. However, there are a number of changes may be made to the embodiments described herein without departing from the spirit or scope of the invention herein it is apparent to those having ordinary skill in the art. 그러므로, 특허청구범위에 따르는 것을 제외하고는, 본 발명은 제한되지 않는다. Therefore, with the exception that according to the claims, the present invention is not limited. 선택자로서 상기 모바일 장치의 홈 어드레스만을 포함하도록 상기 보안 정책 데이터베이스를 변경하는 단계를 포함하는, 어드레스 할당 방법. A selector to include only the home address of the mobile device, an address assigning method comprising the step of changing the security policy database. 상기 키 인가 요구를 송신하는 단계는 내부 인터넷 프로토콜 어드레스를 0 으로 설정하는 단계를 포함하는, 어드레스 할당 방법. The key is the step of sending a request, the address allocation method that includes a step of setting an internal Internet Protocol address to zero. 상기 키 인가 요구를 송신하는 단계는, 상기 모바일 장치가 외부 에이전트 CoA (Care of address) 를 이용할 것이다라는 것을 나타내는 파라미터를 포함시키는 단계를 포함하는, 어드레스 할당 방법. Sending the key request is applied, an address assigning method comprising the step of including a parameter indicating that the mobile device that will use a foreign agent (Care of address) CoA. 상기 키 인가 요구를 송신하는 단계는, 내부 인터넷 프로토콜 어드레스를 0 으로 설정하는 단계, 및 상기 모바일 장치가 외부 에이전트 CoA (Care of address) 를 이용할 것이다라는 것을 나타내는 파라미터를 포함시키는 단계를 포함하는, 어드레스 할당 방법. Sending the key is required, the step of setting an internal Internet Protocol address to zero, and including the step of including a parameter indicating that the mobile unit will use the external agent (Care of address) CoA, the address allocation method. 상기 등록 요구는 송신지 인터넷 프로토콜 어드레스 및 수신지 인터넷 프로토콜 어드레스를 포함하는, 어드레스 할당 방법. The registration request is an address allocation method for a transmission if the Internet Protocol address and the destination internet protocol address. 상기 등록 요구는, 송신지 인터넷 프로토콜 어드레스, 수신지 인터넷 프로토콜 어드레스, 송신지 포트 번호, 수신지 포트 번호, 및 네트워크 액세스 식별자를 포함하는, 어드레스 할당 방법. The registration request is sent if the Internet Protocol address, a destination Internet protocol address, destination port number, destination port number, and an address allocation method that includes a network access identifier. 상기 모바일 장치에 대한 부가적인 선택자로서 외부 터널의 송신지 인터넷 프로토콜 어드레스를 포함하도록 상기 보안 정책 데이터베이스를 변경하는 단계를 포함하는, 어드레스 할당 방법. An address allocation method comprises the step of changing the security policy database, as an additional selector to a transmission if the Internet Protocol address of the outer tunnel for the mobile device. 상기 보안 정책 데이터베이스는, 상기 등록 요구에 포함된 정보를 이용하여 변경되며, 선택자로서 상기 모바일 장치의 홈 어드레스만을 포함하게끔 변경되도록 구성되는, 통신 장치. Wherein the security policy database, and change using the information contained in the registration request, a selector that is configured to change hagekkeum include only the home address of the mobile device, a communication device. 상기 보안 정책 데이터베이스를 생성 및 변경하기 위한 프로세서는, 상기 모바일 장치로부터의 등록 요구에 포함된 정보를 이용하여 상기 보안 정책 데이터베이스를 변경하며, 선택자로서 상기 모바일 장치의 홈 어드레스만을 포함하도록 상기 보안 정책 데이터베이스를 변경하는, 통신 장치. A processor for generating and changing said security policy database, changes the security policy database using the information contained in the registration request from the mobile device, and a selector the security policy to include only the home address of the mobile device database the communication device to change the. 선택자로서 상기 모바일 장치의 홈 어드레스만을 포함하도록 상기 보안 정책 데이터베이스를 변경하기 위한 수단을 포함하는, 통신 장치. A selector to include only the home address of the mobile device, the communication device comprises means for changing the security policy database. 상기 키 인가 요구를 송신하기 위한 수단은 내부 인터넷 프로토콜 어드레스를 0 으로 설정하는 것을 포함하는, 통신 장치. The key is a means for sending a request, the communication device including to set the internal Internet Protocol address to zero. 상기 키 인가 요구를 송신하기 위한 수단은, 상기 모바일 장치가 외부 에이전트 CoA (Care of address) 를 이용할 것이다라는 것을 나타내는 파라미터를 포함시키는 것을 포함하는, 통신 장치. It said key comprising: means for applying to the transmission request is a communication device, comprising including a parameter indicating that the mobile device that will use a foreign agent (Care of address) CoA. 상기 키 인가 요구를 송신하기 위한 수단은, 내부 인터넷 프로토콜 어드레스를 0 으로 설정하는 것, 및 상기 모바일 장치가 외부 에이전트 CoA (Care of address) 를 이용할 것이다라는 것을 나타내는 파라미터를 포함시키는 것을 포함하는, 통신 장치. The key is a means for sending a request is to set up an internal Internet Protocol address to zero, and comprising including a parameter indicating that the mobile unit will use the external agent (Care of address) CoA, the communication Device. 상기 등록 요구는 송신지 인터넷 프로토콜 어드레스 및 수신지 인터넷 프로토콜 어드레스를 포함하는, 통신 장치. The registration request, the communication device including a transmission if the Internet Protocol address and the destination internet protocol address. 상기 등록 요구는, 송신지 인터넷 프로토콜 어드레스, 수신지 인터넷 프로토콜 어드레스, 송신지 포트 번호, 수신지 포트 번호, 및 네트워크 액세스 식별자를 포함하는, 통신 장치. The registration request is sent if the Internet Protocol address, a destination Internet protocol address, destination port number, a destination, including the port number, and a network access identifier, a communication device. 선택자로서 상기 모바일 장치의 홈 어드레스만을 포함하도록 상기 보안 정책 데이터베이스를 변경하는 단계를 수행하기 위한 컴퓨터 실행가능 명령어들을 포함하는, 컴퓨터-판독가능 매체. A selector including computer-executable instructions for performing the step of changing the security policy database to include only the home address of the mobile device, the computer-readable media. 상기 모바일 장치에 대한 부가적인 선택자로서 외부 터널의 송신지 인터넷 프로토콜 어드레스를 포함하도록 상기 보안 정책 데이터베이스를 변경하는 단계를 수행하기 위한 컴퓨터-판독가능 명령어들을 포함하는, 컴퓨터-판독가능 매체. Comprising readable instructions, computer-selector as the additional computer for performing the step of changing the security policy database, whether transmission of the external tunnel to include an Internet Protocol address for the mobile device readable media.